Delicious. And also a bit of a bummer. Only because I made and ate this dish on my own. I’d thawed the chicken a few weeks back when Adam was knee-deep in work and getting home after 10pm most of the time. I knew I wouldn’t be cooking for a couple of days, so I either had to make the chicken for myself or let it go bad. So, I made the dish for myself. And it was delicious, most definitely. But a bummer. Also because any time I set my oven to 500 degrees F the smoke alarm goes berserk, and Adam’s job is to wave at it with a towel while I keep cooking. Trickier on your own, I opened every window and door downstairs to air the place out. Also, I couldn’t find radishes. 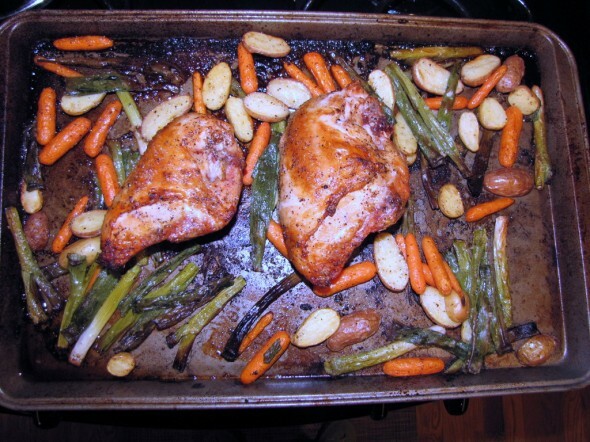 Anyway, a great spring dish, and I actually just used two of the skin-on, bone-in chicken breasts I had in the freezer. Preheat the oven to 500 degrees F. Rinse the chicken and pat dry. 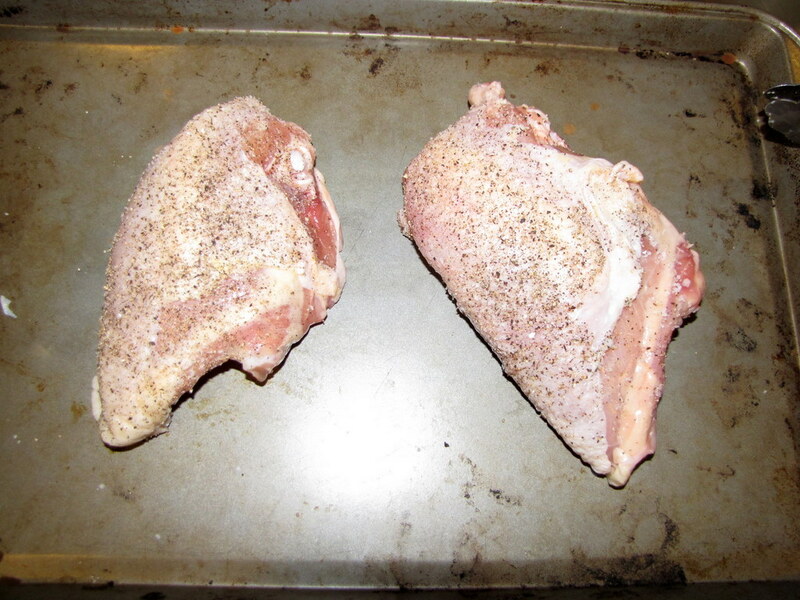 Season with salt and pepper, then place skin-side up on a rimmed baking sheet. 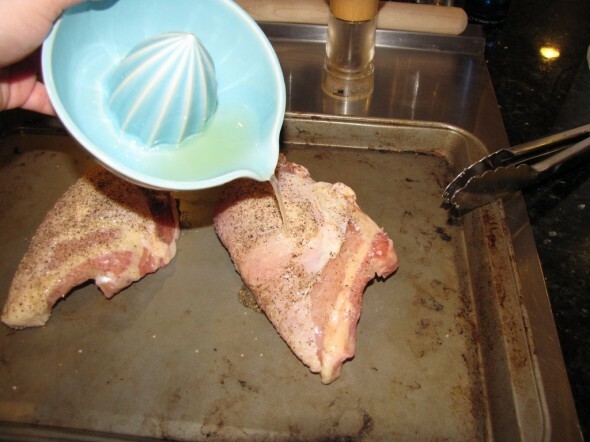 Squeeze 1/2 lemon over the chicken and drizzle with 1 tablespoon olive oil. 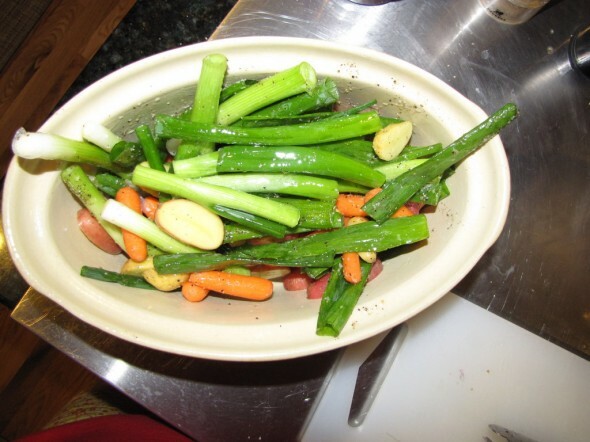 Meanwhile, cut the potatoes and radishes in half and cut the scallions into thirds. 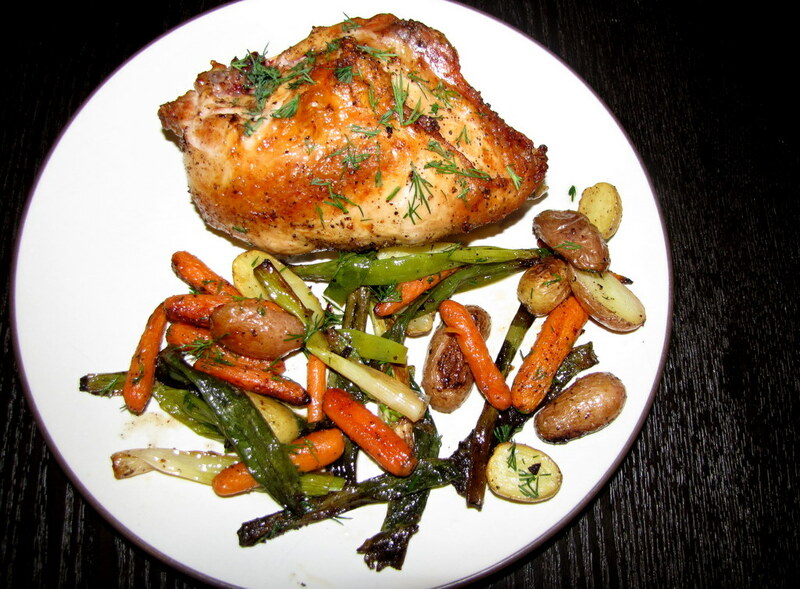 Toss the potatoes, radishes, carrots and the remaining 2 tablespoons olive oil in a bowl; season with salt and pepper. 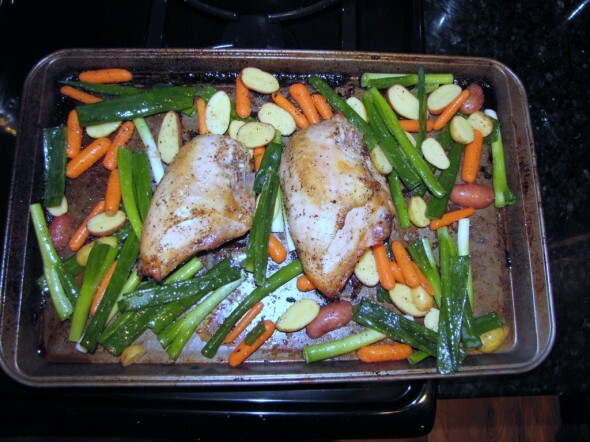 Remove the chicken from the oven and scatter the vegetables around it. Continue to roast until the vegetables are tender and the chicken is golden and cooked through, about 20 more minutes. Squeeze the remaining 1/2 lemon over the chicken and vegetables. Top with the dill and season with salt. I Finally Roasted a Chicken!